I have always had a problem with the concept of "political correctness". In my mind, the very idea of self-censorship or societal censorship because some specific verbiage isn't PC, misses the point by a wide mark. In a sense, it teaches us that while it's ok to perpetuate stereotypes behind language, it's wrong to give voice to them in certain circumstances and around certain people. As far as I can tell, this linguistic sweep-under-the-carpet gives beliefs - the real problem - a hiding place where they can fester over generations, while language is polished and buffed for everyday use. I was particularly angered during the past few days as John Kerry's "botched joke heard round the world" took over the airwaves. It proved once again that John Kerry is a hopelessly inept communicator. But that certainly isn't news to anyone that's had even a single ear to the rails of politics over the past 4 years. So why did this story become the top headline on every 24 hour news channel and every newspaper in America? Because what Kerry had said was terribly un-PC, and was immediately recast by operatives from coast-to-coast as a callous implication that American troops are stupid. If you believe Kerry, the fact of the matter is that he was actually trying to make a joke about president Bush, and that the botched joke was actually supposed to poke fun at the problems that arise from naive foreign policy born out of intellectual laziness. There's nothing terribly inflammatory about that - or funny for that matter. What is inflammatory, is any discussion about a condition that exists in this country and has ever since the switch to an all voluntary armed forces; namely, that the burden of defending the United States is and has been disproportionately carried by lesser privileged citizens, while wealthier citizens with more opportunity have largely taken a pass - their children going on to high-priced colleges and their parents developing foreign policy with little impact on the people in their social circles. To be certain, there are exceptions to any generality, and there most definitely are here. But the fact remains that military marketers spend more money, more time, and greater attention focusing on under-privileged Americans, and consequently, that's where the bulk of the enrollment comes from. What should be inflammatory is this very condition. It's unfair, and a good argument could be made that it leads to if not bad policy, certainly different policy than would be passed if the armed forces were a true cross section of American youth. Unfortunately, the knight in shining armor that is PC stepped in, and will instantly and completely squelch any and all debate about the underlying condition, the actual existence of which caused everyone to react so viscerally to a bad joke. Kerry has now issued numerous apologies (comically confusing as usual), many Democrats have distanced themselves from him and canceled joint campaign events, and no one with serious political ambition will ever bring up this issue again.....which is a good thing, right? Unfortunately, we seem to be heading into a period politically where language matters above all else, and substance rides shotgun or not at all. 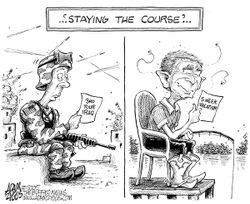 This was evidenced recently by the "big news" that the Bush administration was changing the way it talked about Iraq - abandoning "stay the course" in favor of a more emotionally pleasing slogan. Aside from a few newspapers and pundits, little attention was paid to the fact that nothing had actually changed strategically or on the ground in Iraq. Will the troops be any safer if our civilian leaders start calling enemy bullets "happy metal feeling conveyors"? I expect that this shift will be somewhat short-lived, though, as it is built on the belief that Americans are stupid. They're not. They're just busy and prone to believe that people are inherently good-natured, and for the most part, honest. When sloganeering and cries of violations of the sacred PC are used too haphazardly, and too obviously - as they are now - to divert attention from the truth, my suspicion is that people will wake up and look beyond the language. Just don't tell anyone I wrote this. It's probably not PC, and I don't want to hurt my chances running for assistant coach of our softball team next spring.